After the Israeli Election: What Next? Suzi Weissman interviewed Moshé Machover on her program “Beneath the Surface,” KPFK Pacifica radio in Los Angeles, March 20, 2015. Their discussion has been transcribed by Meleiza Figueroa, and edited for publication here. Suzi Weissman: We’re going to start tonight’s program on the results of the election in Israel. I’m very pleased that Moshé Machover is joining us for the first time on BTS, and we hope to have him many more times in the future. He is joining us from London to analyze Benjamin Netanyahu’s victory in Israel’s election. 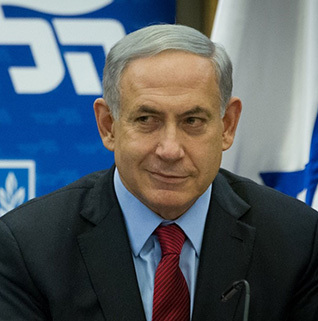 In the final days, Netanyahu veered even further right than before; he declared an end to the possibility of a Palestinian state on his watch, and (on election day) decried Arab Israelis for voting. Moshé is a mathematician, philosopher, dissident, and a founder of the Israeli Socialist Organization, Matzpen (in the 1960s)–and he’s worried mainly that the mammoth in the room, that’s absent from the focus of most post-election analysis, is Netanyahu’s design on Iran. Moshé also believes that the main reason Netanyahu called for an early election in March was this reason, that it was his gamble to rid the government of (his coalition partners) Yair Lapid and Tsipi Livni who would oppose his plans, and that this was also behind the show that Netanyahu arranged with the congressional Republicans earlier this month. Moshé, before we get to Netanyahu’s designs on Iran and his calculations in this election, for our listeners maybe you could just explain how in early decades, Israel had the image of a social democratic society and built up an impressive welfare state, with the most universal healthcare system in the world; we had the symbol of the kibbutz, many Americans went there to be a part of it. And then, something happened. So I’d like to maybe start there: What happened to the forces that were behind those great programs? Moshé Machover: Well, in its pioneering days when Zionist settlement/colonization of Palestine was in its early stages, collectivism paid off. It was a useful way of organizing this colonization. It was very efficient in doing so. You see, it would be useful to think of Israeli colonization as (analogous) to the colonization of North America. The Palestinian Arabs are our Native Americans. And the new nation coming into existence – the Hebrew nation, the Hebrew-speaking nation in Israel – is a settler nation like the American, U.S. nation. That’s a broad analogy, but in its early days, Israeli colonization was best achieved by collectivist means. It was always exclusive of the native population, just as the American settlers excluded the indigenous people. In the original version of the U.S. Constitution, when they counted the population of each state, the American Indians counted as zero. Black slaves counted as 3/5ths of a person, because they were important as labor. Israel’s collectivism (the kibbutz in particular) always excluded the indigenous people of Palestine, the Palestinian Arabs. Until the 1970s, Israel amongst the capitalist countries was one of the most egalitarian. I think you are exaggerating in terms of the universality of health care and so on — it wasn’t as universal as, for example, the British national service. But it was fairly egalitarian in terms of income distribution. Since then, as you know, neoliberalism has come in with a vengeance. SW: Neoliberalism, as you say, is all-triumphant or seemingly so. And Israel, from its more egalitarian roots at least among the Hebrew-speaking population, as you say, has turned into one of the most unequal societies. MM: Yes, on a par more or less with the United States. It’s just as bad as the United States, it’s one of the worst among developed countries. SW: Are there demographic changes that have had an impact on that? Is it all the Russians coming in, the Sephardim (Arab and North African Jews) earlier, that have had an impact, say, on the politics and economic policies? MM: No, I don’t think so. Obviously, you know, as all settler states, Israel was built on immigration. The actual parameters and modalities of immigration were different in each place. I mean, if you look at Australia or North America or Israel — and New Zealand you can throw in as well – all of these are countries built on immigration; and their economic development, which is quite rapid, is also due to a large extent to the inflow of immigration. Immigration is always beneficial for the growth of the economy; it’s not for the welfare of the actual people who work there, that is a different question. So while there has been very rapid economic development, inequality has grown as well. But I think, if you look for specific reasons in Israel for neoliberalism, I think you are barking up the wrong tree, because it is a universal phenomenon. It is something that has been happening in the whole of the capitalist world. The difference in Israel is that the starting point was more egalitarian than in other places, and therefore the change is more extreme. But the actual process is similar to what is happening throughout the capitalist world. SW: And on that, you’ve seen also in Israel, as in the rest of the world, indignant protests against this inequality. It took the form of people protesting against housing prices…Now we have this election, and you say that while people were focusing on the rise of the “Zionist Union” (the electoral alliance of Isaac Herzog and Tsipi Livni), the elephant, or the mammoth, in the room that allowed for Netanyahu to come to victory in this election was his plans for Iran. MM: No, I think you misunderstood me. I think the elephant in the room is the reason why he called for elections. He didn’t need to do so; he had two more years to be in office. He provoked an election because he had some goals in mind. He wanted a narrower right-wing government coalition. The coalition until this month, for the last two years, was the extreme right, the right, and some sort of center-right or center parties of Yair Lapid and Tzipi Livni, whom he wanted to get rid of. So he provoked an election. And the elephant in the room–or if you watch television, very literally staring you in the face–is what you saw in his performance on Capitol Hill. SW: And it was a gamble, you said: and a gamble that he almost didn’t win, because the opinion polls leading right up to the election, except maybe a day or two before, showed that he was neck and neck with the opposition. MM: The surprise is very limited. The opinion polls indicated that the coalition that he had in mind forming–which is going to be formed–would have the majority. But had the Likud (Netanyahu’s party) not gotten the largest number of votes, it would have been very unlikely that Herzog (who would have been invited to form a governing coalition) could have formed a coalition, but it was just possible. What Netanyahu did was, in the last moments, he made an appeal on three issues to the extreme right, and caused people who would have voted for more extreme-right parties to change and vote tactically for him. So what is surprising is not that he is able to form a government but that he gets the first shot, and it makes it easier to form this coalition. The overall distribution of seats between the extreme right, center and left is as the opinion polls predicted. What happened in the last few days is a shift from the ultra-extreme right to Netanyahu, which gave him the privilege of having the first go at forming a cabinet, which he is now going to be able to do. But what I want to return to–you may have heard some commentators saying that his appearance at Capitol Hill was a ploy in order to win the elections. I think you have got it backwards. I think he provoked the elections in order to be able to appeal in this performance on Capitol Hill, and make a pact – an overt pact with the extreme right of the Republican Party – in order to scupper the deal with Iran. I think that Netanyahu has made a very calculated gamble. First, that he’s going to win the elections, which he did, and form a narrower right-wing government, that is to say, narrower in terms of the political spectrum, but stable in terms of seats in the Knesset, which he is going to be able to do. And second, that he has made a very marked change in Israeli relations with the United States, which was formerly based on a sort of bipartisanship, not favoring one U.S. party over another. He has made an overt pact with the American right, and especially the right wing of the Republican Party. His calculation is that the ascendancy of the GOP is irreversible, or is going to be there for a long time, and that Obama is a dead man walking. No Israeli Zionist leader is going to break the alliance with the United States. The question is, with what forces within the United States is the alliance being made? And his calculation is that, as I said: Obama is now out. Of course he’s incensed Obama, but what is Obama going to do? His hands are rather tied by the majority in both houses of Congress. SW: Well, let’s move back to what Bibi Netanyahu’s plan is, and his agenda for Iran. When he talked about it, you know, he really used fear a lot in his campaign and said that Israelis would be more secure with him in power. The former head of the Mossad (Israeli intelligence service) said that Netanyahu was a great threat to Israeli security; others would say similarly. But security used to mean settlements, and periodic wars on Palestinians. And now this focus is Iran. So what’s that about? And what is Bibi’s goal in a war with Iran? MM: That’s a very good question. You see, Israel is not merely concerned with its immediate neighborhood and the colonization of the West Bank and so on. It’s all that, but as part of this, Israel is also a regional power. You have to understand, in the pecking order of the Middle East, Israel is near the top of the pyramid, second only to the big boss, which is the United States. Now, the thing with Iran is not that Netanyahu’s seriously afraid of an Iranian bomb; this is a lie. It is clear that what he said in Congress and what he said in the United Nations in October 2012 are lies. But he is seriously concerned about Iran in a different sense; and the negotiations with Iran are not really about nuclear weapons. Nuclear weapons are only a symbolic way of depicting the negotiations for the consumption of the public. What is really at issue is the place of Iran in the pecking order of the Middle East. SW: So it’s not about carrying out a surgical strike on Iran, but it’s about not letting the United States use Iran as a partner to get more stability in the Middle East. Is that what you’re saying? MM: That’s exactly it. Everybody realizes, including the Iranian leaders, that the top of the pyramid is the United States. The question is, what place will Iran occupy in this pecking order? The deal that is now being hatched is to give Iran a respectable place in this pecking order. But if so, that would actually, relatively speaking, downgrade the importance of Israel. You see? It would, in some sense, erode Israel’s position as second to top dog. Netanyahu is obsessed with this, and is prepared to go even to war in order to prevent any such thing. The only kind of deal he is prepared to accept is one in which Iran is the very bottom of the pecking order. Plus, he has some additional reasons for wanting a war with Iran. Something I’ve been saying for a number of years–and there is good documentary proof of this–is that if a war with Iran causes a conflagration in the whole region, he may actually want to use it as a smokescreen for a major ethnic cleansing of Palestinians from the West Bank. SW: Well, unfortunately, Moshé, we’ve run out of time; but I think we can probably leave it with that very provocative point at the end, and I don’t think that it seems so far-fetched, given everything else that you’ve said. Moshé Machover is an Israeli-born socialist mathematician, philosopher, and activist. He is Professor of Philosophy at the University of London.